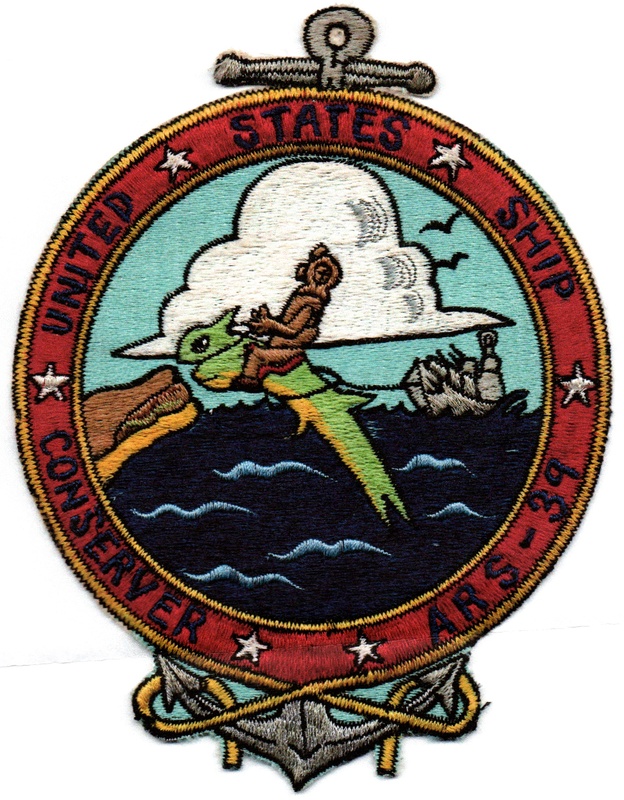 This family gram and patch image were provided by Mike Forney who served on Conserver from November, 1963 to January, 1965. As the Holiday Season approaches, our thoughts most naturally turn to our homes and our loved ones. Many of our brothers-in-arms will be able to speni this holiday season near their loved ores, but for this year it is our turn to stand the watch on the outer perimeter for the defense of our country. As we stand our vigil we take pride and consolation in the fact that it is this alert force, of which we are a small part, and others like it throughout the world that make it possible for our loved ones and all the free world to enjoy the spirit of Christmas in peace and security. On behalf of myself and the officers and men of CONSERVER, I would like to take this opportunity to wish you, who make so large a contribution of patience and understanding toward our task of preserving peach and freedom, a very Merry Christmas and a most Happy and Prosperous New Year. Nine weeks ago, the CONSERVER departed Pearl Harbor leaving Oahu to dissolve on the horizon and headed westward in the direction of the Land of the Rising Sun and the Far East. Shadowed by the giant Albatross for thousands of miles, occasionally passing another ship, we sailed over more or less tranquil seas with seemed more like a peaceful pond that the world’s vastest ocean. The old timers on board agreed that the crossing was the smoothest ever. In addition the daily routine of ship’s work and fighting the constant corrosion caused by salt water, the crew managed to relax at the nightly movies, browser though a wide selection of books and magazines that the library had stocked just before leaving Pearl Harbor, consume over 1226 pounds of meat, drink over 200 gallons of milk and start a beard growing contest. Although our original destination was Yokosuka, Japan, on the tenth day out we were diverted to Hokkaido, the northernmost island of Japan to recover an anchor lost in extremely heavy weather by a U.S. Navy ship in the harbor of an isolated fishing village called Hiroo, on the island’s eastern coast. We changed course and made best speed for Hiroo, arriving at the harbor entrance as the sun rose the day before Halloween. A real pat on the back for the navigators who piloted us over 3,400 miles of open water — this was the first landfall since departing Hawaii two weeks before. Unfortunately, recovery efforts were in vain. Due to high seas our divers were unable to locate the anchor in the muddy bottom stirred up by the tossing seas. Diving was hazardous at best, and late in the afternoon became impossible. There was a rumor that a disappointed Halloween trick-or-treater got an early start and made off with the anchor and floated far out to sea with it. With our divers chilled to the bone by the cold northern waters and immediate further efforts impossible because of the tossing seas, we got underway once again and headed south for Yokosuka, 570 miles down the Japanese coast. Beards were shaved (many mustaches remained), clean in port uniforms were broken out again and we mde preparations to enter Yokosuka for ten days in port. For many CONSERVER men Yokosuka was an old acquaintance, for the new men it was an introduction to something quite new and different — Japan and once far-off Orient. The men were able to get used to solid ground again at the recreation facilities, shop at the Navy Exchanges, and relax in the Navy Clubs, all on the base at Yokosuka where facilities for the U. S. Pacific Fleet are among the finest in the Far East. Many made tours to near-by sightseeing areas — the giant Buddha at Kalrakura, the national park at Hakkone and its main attraction, towering Fujiyama, and of course, Tokyo, the worlds largest city, only an hour away by train. The weather was brisk and clear, not unlike late autumn back in the States. Preparations were made for the remaining months of our cruise with the SEVENTH Fleet, repairs made, and provisions, water and fuel taken on board. Our preparations completed, the crew well relaxed and ready to go, we sailed south once more, this time into the picturesque Inland Sea separating the Japanese main island of Honshu and the smaller island of Shikoku, headed for the textile center of Imabari situated on the west coast if Shikoku. Since this small port is outside the usual operating areas of the SEVENTH Fleet, we went to Imabari as a reprvssentative of the U.S. Navy, part of the President’s “People-to-People Program” which enables people in all parts of the globe to see and meet the American Armed Forces. Our reception in Imabari was one of the friendliest that we had ever seen, and the people went out of their way to extend warm hospitality to their American visitors. CONSERVER men toured the town, browsed through the numerous shops and arcades and sampled Japanese food — rice cakes, raw fish and octopus — while curious townspeople and students asked countless qaestions about the United States (some of the children had only seen Americans in movies and were surprised that we weren’t all cowboys),and collected the crew’s autograph. The ship was open to visitors, and almost a thousand people were shovm through CONSERVER during our three-day stay. They were especially interested in the deep sea diving display and our salvage equipment. Explanations as well as a history of the ship printed in Japanese were given to all visitors. In Japan, the next thing that comes to mind about America after cow-boys and Indians, is baseball, and the Japanese have adopted our national sport with great enthusiasm, especially, as we found out, in Imabari. When the town officials paid their first visit to the ship, they could not depart without challenging the CONSERVER softball team to a game with a team from Imabari, a team made up entirely of girls. We accepted, but for the sake of international relations, decided that we would not beat them too badly. The next day, over a thousand spectators, including the It-Mayor, turned out to watch the great event, for the people of Imabari are very proud of their girls’ team. And we learned why. The final score is embarrassing, but it must be told that the girls managed to run wide circles around CONSERVER‘s courageous team; we were able to get only five men across home plate (our opponents were just being polite). After seven innings and 15 runs by the girls, we held up the white flag. We learned then that the girls had recently won the Japanese championship, and although our faces were red, we believe they could almost give the New York Yankees a run for their money. The next day, seeking to restore the tarnished image of American sports, refinished another local team (all male), this time on the basketball court, and again to our astonishment, the final whistle showed us the losers by eight points. But it must be said that both defeats did more to bolster the prestige of our teams and 100 victories, and all hands were gracious losers. After all, Olympic games are only a few months off, and America will have another chance to regain its status. We were presented medals and flowers by the local teams in the Japanese custom, and we reciprocated by presenting each of them with embroidered CONSERVER patches. We departed Imabari sadly, but knowing that this small town in Japan had seen something more of our country than just a Hollywood movie set. We. too, will not forget the great warmth and friendliness which we were welcomed by the people of Imabari. Once more we turned south, this time heading down to Okinawa and the mild climate of the Ryukyuan Islands. Since one of our missions with the SEVENTH fleet is to assist in training other ships, we spent the next week towing targets off the east coast of Okinawa, providing gallery practice for locally-based aircraft and ships. We came into Buckner bay Okinawa to pick up provisions and sealed again for Japan after two days. Just prior to leaving Okinawa about six o’clock in the morning on 23 November, we received the tragic news of President Kennedy’s assassination over the ships radio from the Armed Forces News Service in New York, and during the day at sea we had continuous news coverage piped throughout the ship to keep the whole crew informed of the latest developments. In the uncertain hours of that day the immense importance of our mission and our great responsibility as members of the United States Navy was brought home to each man. We share our country’s great sadness. Sasbo, our next port, is on Japan’s Southern Island of Kyshu, a main shipbuilding center and modern city. Sasebo is familiar ground for many and when it was not raining the crew made use of the base facilities and Exchanges to wind up Christmas shopping and generally relax. Thanksgiving day was celebrated on board with a traditional menu of roast turkey and baked ham, complete with pumpkin pie and ice cream, all prepared by our cooks who worked into the wee hours the night before. All agreed it was just like home, with the obvious exception that our loved ones were not there. In Sasebo came word that a Philippine Navy ship had stranded in the northern Philippines, during a typhoon. Our schedule called for visits to more ports in Japan and Taiwan, but our plans were necessarily changed and we made all preparations to leave for the Philippines to salvage the unlucky ship. Through familiar waters once more we set out from Sasebo, steamed down the Japan Current past Okinawa and Taiwan, through the Bashi Channel, and finally along the mountainous coast of Luzon, the largest of the Philippine Islands, enroute to Subic Bay and the US naval base just to the north of Manila. Having arrived in Subic, we are now preparing for the salvage job ahead, loading provisions, fuel and water, as well as salvage equipment in addition to that carried a board. We had looked forward to Christmas in Hong Kong, but possibly to salvage project will last sometime. However, our next newsletter will fill in the details. Thus far, our duty in the Western Pacific has been most interesting and a great success. The seas have been mostly calm (the old-timers are secretly disappointed because they haven’t had a chance to show off their sea legs yet), the skies fair (except for occasional rain), and the winds balmy. We in the CONSERVER send a fond Aloha across the seas in the Western Pacific and again wish you a Merry Christmas and the happiest of holiday seasons. I will haft to check my files but I think a have a few family grams Capt. Lamb sent to my folks.